Isobel McPherson vandalised her neighbour's three vehicles on Cairn Road in Bieldside over a six week period. A pensioner caused more than £5,000 worth of damage to her neighbour’s cars by scratching them – for no apparent reason. Isobel McPherson vandalised her neighbour’s three vehicles on Cairn Road in Bieldside over a six-week period. The owners noticed two days after leaving them parked that they had all been damaged. They contacted police when they spotted further damage almost two weeks later. Other neighbours began coming forward to let them know they had captured video footage a woman who appeared to be McPherson at the relevant times. The couple, who did not know the pensioner, installed their own CCTV camera which later filmed the 61-year-old in action. When officers initially spoke to the former document controller, she initially denied any wrongdoing. However, she admitted causing malicious damage between May 18 and June 30 last year during an appearance at Aberdeen Sheriff Court where she returned yesterday to be sentenced. 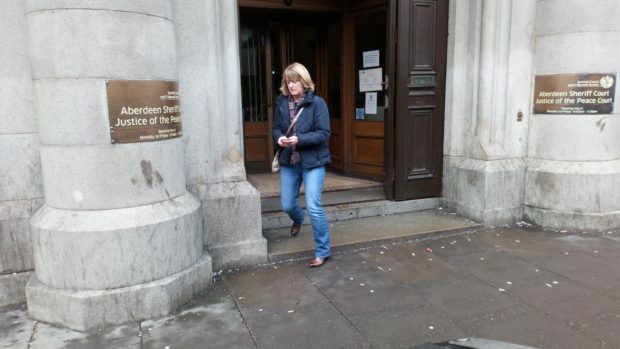 Fiscal depute Felicity Merson told the court the total cost of the damage was £5,096.65. Representing McPherson, defence lawyer Peter Keene said he was at a loss to explain her conduct. He said: “She is a 61-year-old lady, worked all her life both in this country and overseas, she worked as a document controller for an oil business. “She is trying, and is at a loss, to explain how it was she found herself damaging these vehicles, not once but on three occasions. He added that his client would like “nothing more” than to repay the damage done. He ordered her to repay the damage and fined her an additional £1,000.